One of the most interesting aspects of OpenStreetMap is its global scope. The whole world map is editable wiki-style, and the various techniques for creating maps can work just as well in Niarobi and Nagpur as they do in Newcastle and New York. The project has always been most active in countries like the U.K. where we have lots of commercial map data but want free map data. Often in developing countries there is some commercial map data, so the same considerations apply, but then there are places which have just never been mapped by anyone. It’s quite difficult for me to imagine living in an city without ever seeing a map of that city. But many people do, and presumably they don’t really know what they’re missing. They’re missing a basic information tool for planning development, supply lines, day-to-day life. Mikel Maron is back from the slums of Nairobi (specifically a massive slum called Kibera) where he has been working with local people on creating the first ever map of the area. His blog post ‘Some notes on Map Kibera mapping‘ gives a hint of some of the amazing stories he has to tell from this experience. No doubt he’ll give another great conference presentation about it. With OpenStreetMap we can build great maps of developing countries. We can do it ourselves (remote mapping) or local people on the ground can survey the streets. Or some combination of the two. Remote mapping A.K.A. “armchair mapping” by sketching over aerial imagery, is a good way to build a basic map quickly. It’s a sensible first step even if you’re in the area, but of course it doesn’t matter where you are sitting, or which bit of the world you are mapping (although availability of aerial imagery is a limitation) Another point which bears repeating… you don’t need a GPS unit! Gadgets are fun, but armchair mapping is easier and more accessible than that. Anyone with internet connection can get involved. If you’re looking for ideas of where to do some remote armchair mapping, the Humatarian OpenStreetMap Team page lists some possibilities. Often this involves mapping of disaster zones. At the moment we are trying to quickly improve our map of Haiti after the earthquake which happened there yesterday. Google maps have good coverage, but the hope is that our open licensed maps and open access to the underlying data might be useful in some small way for aid agencies responding in the short term or to local people as they recover from the disaster in the longer term. In addition, we have the potential to produce maps which are more up-to-date (e.g. showing collapsed bridges) if we get some information from people on the ground. We can also map details which google maps don’t normally show, where such things are recognisable from the sky. We’ll need to boost the general completeness of our map before any of that can happen though. Beyond that, there’s plenty of armchair mapping to do in the developing world. There’s a list of cities with Yahoo Aerial Imagery coverage (We are allowed to use Yahoo!’s imagery for OpenStreetMap) Any city in India could probably do with some help, apart from Chennai which is beautifully mapped! If you prefer armchair mapping closer to home, there’s things like tracing U.K. rivers from NPE or wade into the big TIGER fixup job in the U.S. 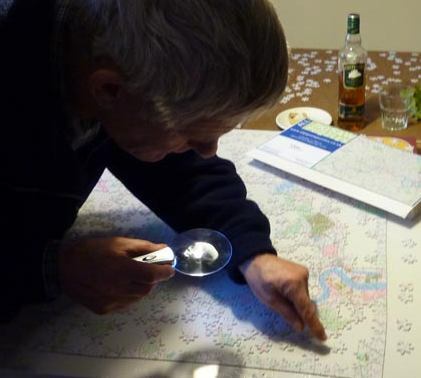 Endless mapping possibilities available directly to you in your armchair, so get stuck in! So there you have it. It is do-able. That’s a relief. I hadn’t thought about the text orientation advantage. I guess that does help a lot.